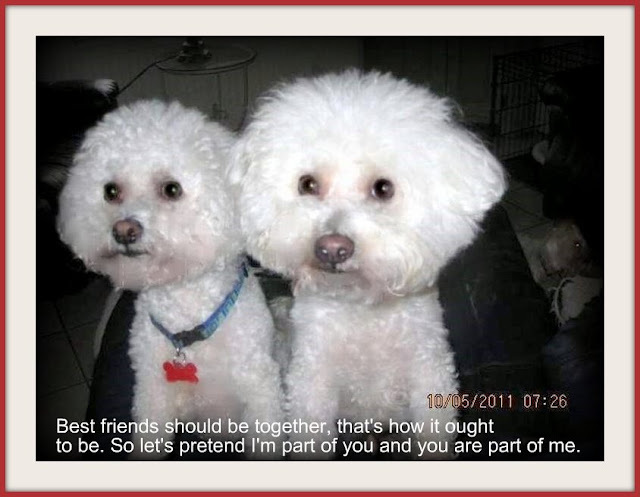 For more information, visit Tidewater Bichon Rescue's Web site. Yes, you know the words... you know the song. Now, do you know a family for these boys? Their humans got divorced... whatever that means, and now Jack and Jake are looking for a home. I think for 2012 we need to find these boys a forever home! So, while you sing the song to yourself, think hard... who do you know who can love two wonderful boys? I don't like this divorce thing. AH! That little one of the right's eyes have captivated the Mama! So sweet. She also says that you can't blame DIVORCE for homeless pups - she'd leave the Daddy long before she ever left one of us behind like that. Husbands may come and go, dogs are fuever! all good mamas are piranahs when it comes to protecting, its the way we are. Oh my!! These two are just precious!! I would SO love to take these two home!! It makes me so mad!! We have had the DISCUSSION here as well. I told him it is a package deal...if the dogs go...I go! Guess who won? I will keep my eyes and ears open! Paws crossed they find a perfect FOREVER home! Laughing at the "discussion". Momma says the alternatives to dogs daddy could not live with. But seriously, how emotionally bankrupt do you have to be to reduce your dogs to chattel?